One + One = Two skeins! That's all it takes to make any of these 25 breathtaking knitted accessories. 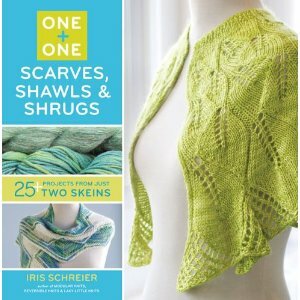 Scarves, Shawls & Shrugs is the first in a new series by renowned designer Iris Schreier that showcases the many possibilities of working with just two skeins of yarn. Mixing yarn types, weights, and colors, she presents a dazzling array of stylish and sophisticated wraps. Schreier created about half the projects herself, while other prominent designers provided the rest. Love the projects in this book? Check them out here - we've built a kit for every single project! Love the projects in this book? Try one - we've built a kit for every single project! View all the One + One Knitting Projects!